Marianne Raynaud here from QualityTime ESL. I would like to say a few words to any teachers using Essential English with their students. These recordings in the form of podcasts are intended as a supplement to your teaching and in particular as oral exercises students can do on their own on mobile devices such as MP3 players, iPods, smartphones, tablets, iPads etc. If you wish to give your students translations of the words I use, you can easily open the Word document found on the website and type in any information you wish to give in English or in the students native language. It is also possible to make audio files with just one or two of the exercises in a podcast. In that case you open the MP3 file with Audacity, a free software program to edit oral files, and then you select the parts you wish to eliminate before creating a new file. Finally, you just export this new recording as an MP3 file that you can use with your students. Don’t forget to go to our website www.QualityTime-ESL.com to get the suggested lesson plans for the Essential English podcasts. They will give you an idea of how to exploit these exercises in the classroom. 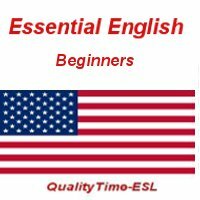 All this material is free of charge, as I believe it is very important for people everywhere to have a basic knowledge of English. I also feel it is important for everyone to have some basic knowledge of several other languages besides English. This series of podcasts is my way of contributing to the movement of global education available through the Internet. Teachers have probably noticed that we have not introduced many nouns so far. I believe that nouns and adjectives can best be taught either through pictures or translations from the native language. Moreover, the choice of these words depends to a great extent on the culture and social environment of the learners as well as on their needs. If the learners want to be able to speak about their towns and homes, they will need the appropriate language that is best taught by a teacher on the spot who is familiar with their way of life. If the students will use English to travel, they will obviously need a different type of vocabulary. We will be introducing nouns and adjectives later on, but I believe it is essential to be able to use verbs correctly. By this I mean the basic verbs that exist in most languages. It is also vital to know how to construct sentences with different tenses and to use the interrogative form. So that is what we will be insisting on. We want students to be able to quickly make up short sentences with what we consider to be vital vocabulary. As soon as your students have reached a good level, they will be able to work on our other series “QualityTime-ESL Podcasts” to perfect their grammar or “Your English” to build vocabulary. They will of course rely on you to give them information, advice and translations into their native tongue, if they have not been able to find the equivalents on the Internet. I wish you good luck with your work, and I hope to hear from you to find out how you are doing and how your students are progressing. We welcome ideas that can lead to new podcasts and new exercises. We thank you for your interest in QualityTime-ESL products. Bye for now. Take care.